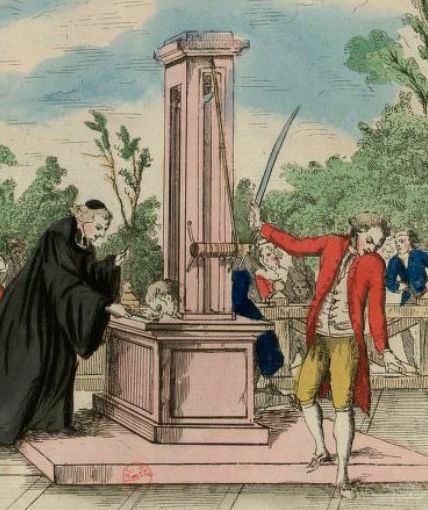 On this date in 1792, the French Revolution’s iconic execution machine made its quiet experimental debut on the grounds of a suburban Paris hospital. 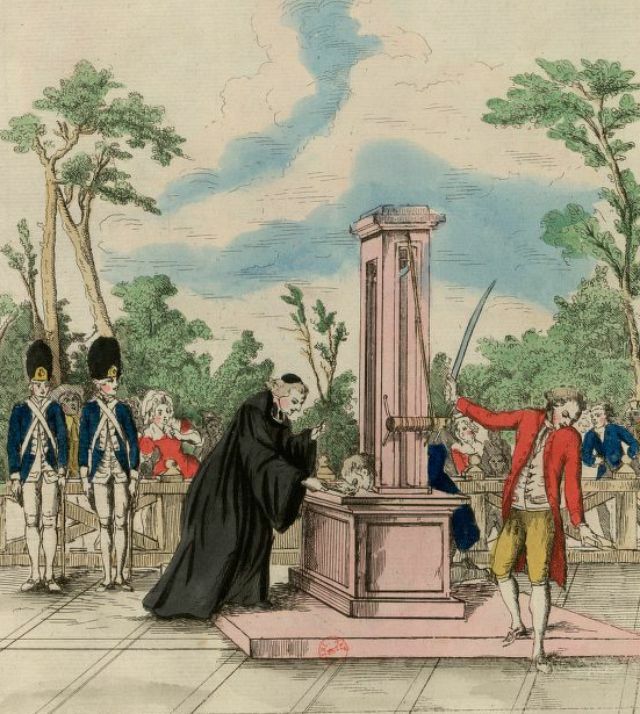 The invention would initially be known as a louisette or louison in his honor, before that moniker was supplanted by the surname of a different physician who had become known (derisively, at first) for proposing a mechanical beheading device: Joseph-Ignace Guillotin. Lawmakers’ shyness stems as Friedland sees it from their ambivalence about the entire project of public executions with their unruly rabble, pornographically agape: in this courtly sketch of the proposed machine, even the executioner — and this behavior is explicit in its original caption — coyly averts his eyes as his sword-arm releases the blade. It was on March 20, 1792 that Assembly’s Committee on Legislation authorized deploying the as-yet uninvented device and “almost immediately, there followed an urgent, almost frenzied effort to build a decapitating machine as quickly as possible.” Executions remained suspended in the interim but Louis worked with dispatch, and an efficient carpenter named Guidon,† and the device performed its first real execution a mere five weeks after the enabling legislation, on April 25. This date was its dry run, courtesy of a few fresh cadavers at the Bicêtre Hospital. That facility’s chief surgeon, one Cullerier, was very happy to make Dr. Louis’s arrangements. You will find at Bicetre all the facilities that you desire for the trial of a machine that humanity cannot see without shuddering, but which justice and the welfare of society make necessary. I will keep the corpses of those unfortunates who die between today and Monday. I will arrange the amphitheater … [and if] the ceiling does not accommodate the height of the machine, I can make use of a little isolated courtyard situated next to the amphitheater. The honor that you are bestowing on the House of Bicetre, Sir, is a very nice gift that you are giving me, but it would be even more so if you wished to accept a simple and frugal meal, such as a bachelor can offer. The reports ring with awe, and well they might. For an Enlightenment audience that theretofore had known beheadings only via the error-prone action of an executioner’s muscle, it must have been a wondrous spectacle, a triumph of ingenuity and philosophy for a humane new age. * Executed Today long ago interviewed Dr. Friedland about this book. ** A rival proposal called for automating death via a sort of proto-gas chamber: the executioner to “attach the condemned by the neck, feet, and hands behind the back [to a post on the scaffold], all of which he would cover or enclose in a kind of booth, 5 feet square, equipped with panes of glass on all four sides and with a tight-fitting cap on top … charcoal, sulfur, and other materials that cause asphyxiation could be introduced into the booth by means of an inverted funnel in such a way that the condemned would suffocate and expire instantaneously.” Yet another proposal called for a strangling machine. † “Who charged 5,500 francs for it,” report the memoirs of the Sansons, which also notes that by way of experimentation, two of the cadavers were beheaded with the familiar-to-us oblique knife, and the third less satisfactorily with a crescent-shaped alternative.